During the first decade of the twentieth century Holst became interested in theosophy, as well as in Sanskrit literature. Vedic theogony appears shortly after in his Indian-themed works: Sita (begun in 1899 or 1900), Maya for violin and piano (1901), and Indra for full orchestra (1903). Holst followed up these works with the chamber opera Sāvitri (1908–9). The unpublished three-act opera Sita (1900–6), based on the Ramayana, was awarded Third Prize in the Ricordi competition in 1908; the work was never performed. A passage in act 1 includes the use of an offstage chorus of “voices of the earth . . . to be placed so far away that only a faint murmur is heard by the audience.” 1 This example of dramatic vocalization predates Vaughan Williams’s studies with Ravel, performances of Delius, and Debussy’s “Sirènes” in London. The women’s chorus was originally written as SATB but altered at the suggestion of Hermann Grunebaum, conductor of the first private performance on 5 December 1916 at the London School of Opera, Wellington Hall, St. John’s Wood. The first public performance was on 23 June 1921 at the Lyric Theatre, Hammersmith, conducted by Arthur Bliss. Dramatic vocalization again occurs when Death reappears to claim Satyavan. The wordless chorus finally joins with Savitri as she rejoices in her victory over Death, who has yielded to Savitri’s plea that her life cannot be complete without Satyavan. At the performances at the Lyric Theatre, Hammersmith, and at the Royal College of Music, there was no attempt at local color, or at superficial Indian effects; yet the atmosphere seemed strange and remote, and the thought (to those of the audience who had never been in India) seemed thoroughly in keeping with what they imagined Sanskrit literature to be. In this opera the chorus is instructed to remain hidden from the audience’s view; its contributions are kept to a wordless vocalization, its use only occurs at the mention of maya—illusion—or the appearance of the supernatural character of Death. It is not insignificant that Holst would make an association with maya and its “otherworldly” depiction by means of wordless vocalization. 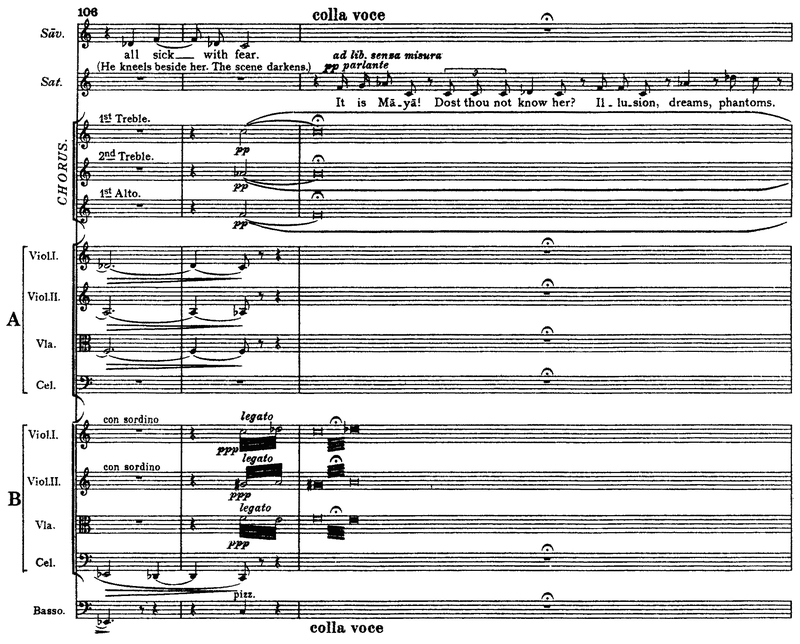 1 Raymond Head, “Holst and India (I): ‘Maya’ to ‘Sita,’” Tempo 158 (1986): 6. 2 Edwin Evans, “Modern British Composers VI.—Gustav Holst (Continued),” Musical Times 60 (1919): 591. 3 Gustav Holst, Sāvitri: An Episode from the Mahabharata, op. 25, rev. Imogen Holst (London: Faber Music, 1973), 1. 4 Colin Matthews, liner notes to Sāvitri, by Gustav Holst, Hyperion CDH55042, 2. 5 Gustav Holst, Sāvitri: An Episode from the Mahabharata, op. 25, 7. 7 J[ohn] B[rande] Trend, “Savitri, an Opera from the Sanskrit,” Music & Letters 2 (1921): 349.